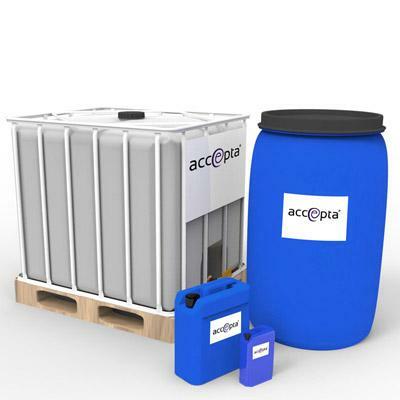 Accepta 2978 is a “next generation” stabilised bromine biocide formulated using a new, advanced stabiliser to create a super concentrated, activated bromine liquid that gives excellent, long-lasting results against problematic biofilm, algae and a wide range of bacteria including Legionella. Accepta 2978 is formulated using an advanced patented compound that works to stabilise the activated bromine in solution without interfering with its biocidal properties. This significantly increases the active component available in solution (by up to 68%), reduces product application rates and improves monitoring and system control for a more effective, cost efficient water treatment solution. Industrial and commercial re-circulating cooling water systems with longer half-life. Oil recovery systems including fracking. Enhanced performance. Improved product stability delivers significant increases in the availability of active biocidal component (up to 68%). Cost effective. Reduced product application rates. Powerful. Long-lasting results against biofilm, algae and bacteria including legionella. Improved control. Optimise product dosing and control using ORP to save money and improve system protection. Easy to use. Single feed, pre-activated solution for easy application. Effective at elevated pH >9. Application rates for Accepta 2978 vary according to the conditions identified at specific sites. For further assistance please contact Accepta technical support team. At end use concentrations, Accepta 2978 is compatible with all commonly used materials of construction used in cooling systems. Store product in a cool, dry environment in the original container. Avoid freezing temperatures, extreme heat and direct sunlight.